Our newest Cure Arthritis Ambassador, Carmen Mata, known online by her username, @Lil_RA_Warrior, is just that: A warrior. 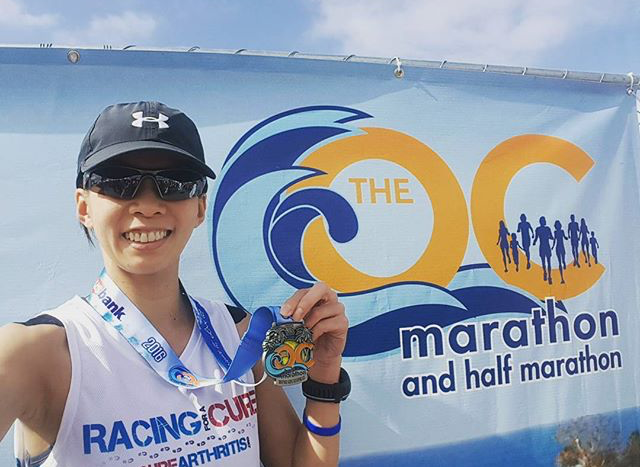 Through the course of her battle with rheumatoid arthritis (RA), she has run 21 half marathons, 4 full marathons, countless 5Ks and one ultra-marathon. She is no stranger to facing a challenge and she continuously inspires the RA community. Carmen has suffered through arthritis related pain since she was a teenager. She initially chalked it up to injuries sustained from a car crash, then later, as a result from her demanding job at a bank. However, as Carmen got older, she could no longer ignore the pain. After an alarming trip to urgent care, the doctor suggested she visit a rheumatologist. She was officially diagnosed with rheumatoid arthritis in 2009 at the age of 36. From that point on, Carmen has been a dedicated member of the Racing For A Cure team, raising awareness through her running and through social media. As a Cure Arthritis Ambassador, she hopes to change the public perception of arthritis. She wants the world to know arthritis is so much more than physical pain, but a multifaceted disease: emotional, exhausting, and stressful. She also aims to create a sense of community among others with arthritis, pointing out how isolating the disease can be. Carmen always offers a listening ear to those suffering; she never wants any patient to feel alone. Join Carmen Mata and the Cure Arthritis Ambassadors in the effort to cure arthritis by joining the Cure Arthritis Crew today!